The applications are invited from the candidates to apply for KPK Internship program 2018, which has the duration of one year and it is offered to the students belong to KPK & FATA. The KP internship portal is now open and this internship is provided to the students belonging to KPK and FATA students. The students will be granted the monthly stipend of Rs.25,000/- to the internees under KP Youth Internship program. It is worth noted that the duration of the internship will be one year and it can be extended to 2 years in case of any special case. It is the first time KP will offer the internship in Pakistan. The policy will be launched for long term to help the young graduates, certificate holders of professional courses in various fields and in order to develop the intellectual skills and it can provide the experience to encourage the caring members of their communities. 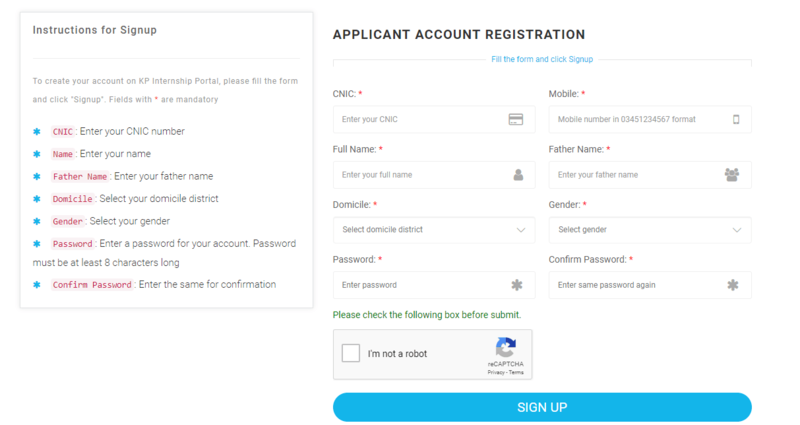 PMRU KPK Internship of one year paid internship portal is now ‘open’ for registration. The internees, who do not do the registration with this program, they will not be awarded the internships and they can apply online for KPK Internship program 2018.
in technical field from a recognized regulatory body. This internship is exclusively for the candidates having domicile of KP/FATA. Concerned department/organization shall upload the following details on KP-Internship Portal after approval of the project. Required qualification/skills etc. given on the portal. Apply for specific internship slot. 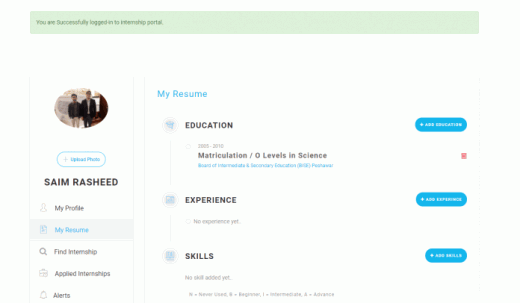 You can download the list of potential candidates from KP-Internship Portal. Invite the selected candidates for interview. select number of required interns. Note: No Internee will be hired without their registration on KP internship portal. 2. Enter the Required Details and Click on Sign Up. 3. Then after Sign Up. Login to your account again by entering your CNIC number & password. 4. This will open a window, which is given below in the picture. Complete the profile like Education Matric, FSc, Bachelors Etc. 5. Give detail of experience & skills, if any.